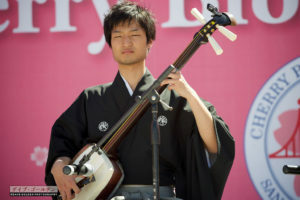 Every year the Northern California Cherry Blossom Festival’s Japanese Music Program brings artists and performers from all over Japan. 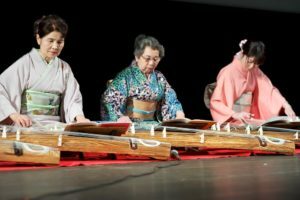 Each year we have some exciting artists and programs from Japan from areas like Okinawa, Osaka, Tokyo, where they perform at our stages like Peace Plaza stage, Webster Street Stage, JCCCNC and the Hotel Kabuki. The koto, or Japanese harp, has 13 strings and is traditionally made from paulownia wood. Originally an instrument of the Imperial Court, the koto has long been a symbol of elegance and tradition. Today, many artists are experimenting with new genres of music like jazz and pop. Listen to the variety of styles new and old, brought to you by these talented schools and performing groups. The music and dance (odori) of Japan is also different from the other types of music. The special slow gestures and movements and the music accompanying the dance styles are also interesting and they are examples of Japanese culture and traditions. There are many dance styles that can be viewed at the festival that the Japanese traditions hold from the early ages. The music and style of performance of these dances are entirely different from the western ones.